Asim Islam holds a graduate degree in medicine from the University of Cambridge and a Ph.D. in mathematics from Royal Holloway, University of London. He wrote his doctoral thesis on analytic number theory and is currently studying quantum field theory at Imperial College London. But he was also interested in what the Islamic philosophical tradition might contribute to his science-infused questions about the nature of human perception and self-awareness. In 2016 Islam began a deeper investigation into those questions as one of two inaugural Science and Religion Research Fellows at the Cambridge Muslim College. The college was founded in 2009 in the storied university town of Cambridge, England by Timothy Winter, a British academic and convert to Islam, to create an institution to promote Muslim education and greater dialogue between Islamic intellectual traditions and the modern world. The sometimes-fraught relationship between present-day science and religion is a key part of that dialogue. The contribution of Islamic scholars to the development of the Western scientific tradition is undeniable. But much has changed since the so-called golden age of Islamic culture in the late medieval period, when scholars from Bukhara to Cordoba recovered Greek and Roman scientific discoveries from their Dark Ages obscurity and made huge strides in fields ranging from mathematics and optics to anatomy and zoology. In recent times, though, Islamic thought and scientific advancement have been much more disengaged from the dominant Western scientific tradition. 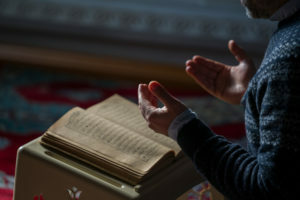 Cambridge Muslim College’s science and religion program strives for re-engagement on two fronts — adding courses in the natural and social sciences to its one-year diploma program for graduates of traditional Muslim religious training programs, as well as offering inroads for practicing scientists to engage with Islamic thought and theology through the research fellows program. Imtiaz says that the conference was oversubscribed, drawing dozens of attendees. “It wasn’t a conference simply involving Muslims talking about consciousness; it included rather non-religious professors of physics and maths talking about the nature of consciousness,” he says. The other inaugural fellow for the science and religion program was John Mayberry, a professor of gastroenterology who used his one-year fellowship to study the interaction between traditional and modern medicine. He provided a seminar on the practice of hijama, a form of cupping that is used widely as a medical treatment in traditional Islamic contexts. Mayberry shared his findings on the ways that hijama is used and regulated in modern British contexts, as well as its efficacy for use as a pain management technique. For the program’s second year, Asim Islam is continuing his work, while physicist Yaqub Chaudhary has begun using his research fellowship to study how cutting-edge research in neuroscience and artificial intelligence relates to Islamic conceptions of the mind, intelligence, and human reasoning. In addition to using resources at the college and at nearby Cambridge University to pursue their individual projects, the research fellows also regularly interact with the college’s one-year diploma and three-year Islamic Studies Bachelor’s degree students, both in scheduled sessions and in more informal gatherings. “We have very interesting conversations over lunch,” Imtiaz reports. Learn more about the Cambridge Muslim College’s science and religion fellows.